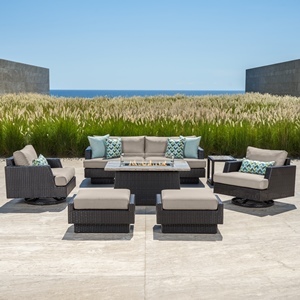 Take your meals outside with our new Portofino Dining Table Set, designed to accommodate up to 8 guests. 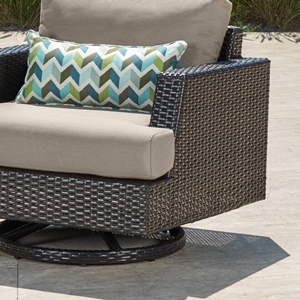 Featuring faux wood with rich woven accents, the kit includes comfortable high back armchairs with 3-inch thick Sunbrella seat cushions to provide the perfect place to sit and enjoy an outdoor meal or converse with friends and family. 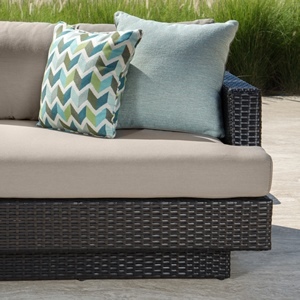 Table top features realistic faux wood slats with a lightweight aluminum frame wrapped in SolarFast® all-weather resin wicker that is durable and designed to withstand the elements. Beautiful and durable faux wood top includes a hole for umbrellas up to two-inches in diameter. 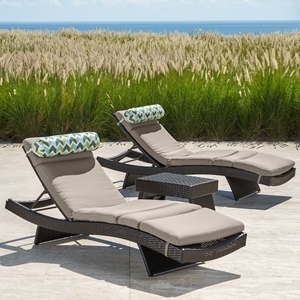 Designed to coordinate with the pieces in the Portofino Comfort Wood Collection. Items under 100 lbs will be shipped via UPS ground. All other orders will be shipped LTL, with an appointment scheduled by the freight company. Estimated delivery time is 7-10 business days; however, during peak spring and summer months, this may increase.<br><br>White Glove Delivery: For an added convenience, White Glove Delivery agents will unload and place your furniture to the preferred location, and remove all shipping waste when completed. Not all orders qualify for White Glove. If interested, please call us for more information.